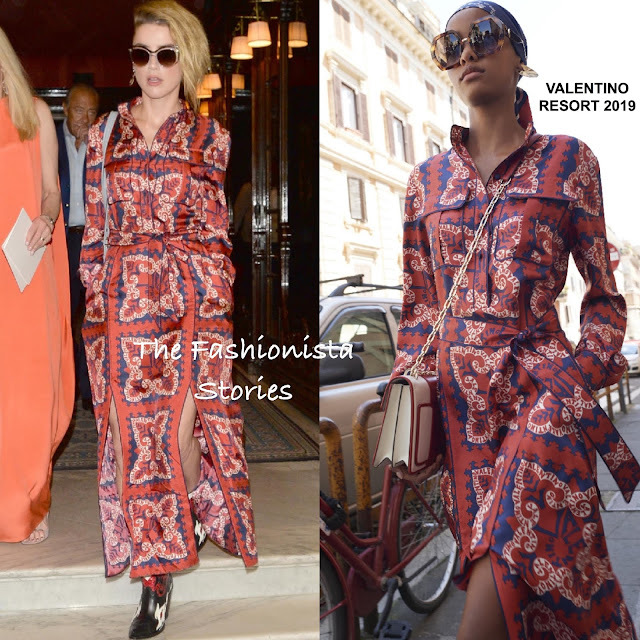 Earlier today(July 4th) Amber Heard was spotted leaving her hotel in Paris, on her way to the Valentino F/W 2018 Haute Couture show during Paris Haute Couture Fashion Week. Probably paying homage to today's holiday, she wore a red, white & blue logo printed VALENTINO RESORT 2019 ankle length shirtdress with a tie waist, side splits and side pockets which she utilized. While this would have looked great with sandals, Amber rocked black, red & white leather ankle boots which I think worked as well. Separating my feelings about her recent insensitive tweet, I like this look. Are you sold on Amber's printed look?